All answers to behavioral interview questions should be structured around 3 components. The situation or task in which you displayed the behavior in question, the actions you took and the results of these actions. This is known as the STAR method. The interviewer is asking you to provide a real-life example of how you have previously used or demonstrated the required job behavior or competency. The situation or task is the background or context in which you took action. The actions are what the candidates did or said in response to the the situation and how they did it. Actions commonly include steps taken to complete a task or project, solving a problem or overcoming a challenge, making a decision and interacting with managers and customers. The results are the effects or outcomes of the candidates actions. The changes, consequences and differences the actions made and if the actions were effective and appropriate. Go through the list of standard behaviors required for successful job performance in a wide range of job categories. 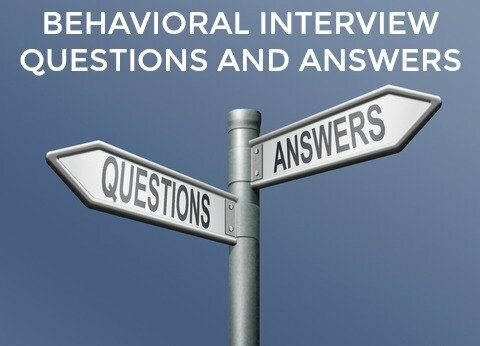 Know what the interviewer is looking for in answers to behavioral questions that explore the competency or behavior. Use the answer guidelines to determine appropriate past situations where you have used or demonstrated the behavior. Prepare and structure your behavioral example to provide the information the interviewer wants. The examples you present in answers to behavioral questions that determine your ability to plan and organize should include the following actions. Your answers to behavioral interview questions about using your judgment and making decisions should include the following steps in the decision making process. Use past examples that demonstrate the following key elements to successful problem analysis and problem solving. Behavioral examples that you use in answers to behavioral interview questions that explore your adaptability should contain these elements. ability to work as part of a team should focus on examples that show the following. Examples of past behavior that indicate high work standards should include these elements. Answers to behavioral interview questions that center on your communication skills require a behavioral example that demonstrates the following. Creativity is not just about making music or art or coming up with a great advertising campaign. It is about generating new ideas, approaching tasks and processes differently, coming up with non-traditional solutions to problems. It is a highly valued competency and employers are more and more aware of the need for creativity in their workforce in order to be competitive and successful. What does the interviewer want in behavioral interview answers? Vague responses - these include generalizations that do not provide a specific situation. Avoid using phrases such as "Most of the time...", Usually...", Sometimes..."
Opinions - the interviewer is not asking for your opinion. He or she wants a real-life, factual example of what you did in a certain situation. Avoid phrases such as "I believe...", "I think...", "In my opinion..."
Theoretical answers - these answers indicate what you would do rather than what you did do. 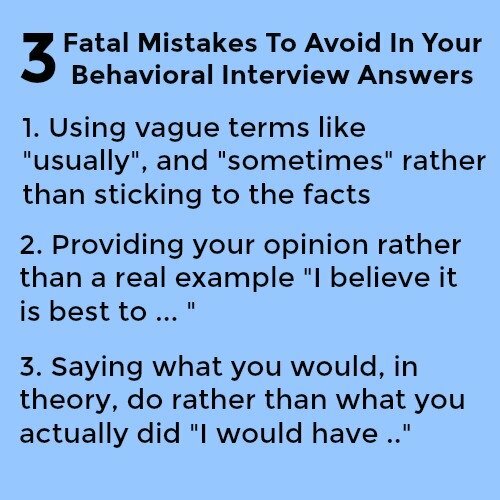 Avoid phrases such as If I had ....", I would have...", "I might.."
Be well prepared for these type of behavioral interview questions in your job interview.